The number rule of thumb for newly listed companies are "To treat your CFO well". This is because is he or she resigns just after the IPO, it usually spells trouble for the listed company. 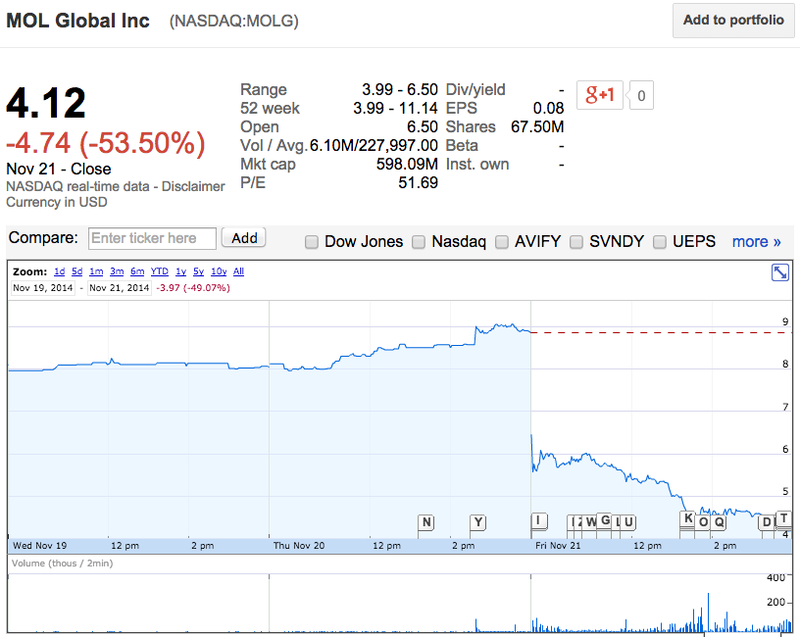 This is just what happened to MOL Global. Barely a month after its listing in NASDAQ, which is supposed to be a good thing as it was already valued at more than RM1 billion with that listing, has seen its shares dropped more than 50% yesterday. The way investors community looks at it is that usually the burden of the reporting relies on the CFO and if he is not happy and resign, that is a bad sign towards the financial conduct of the company. This is especially so for a company that has just listed, more so on the news that its CFO resigned after having joined for less than 3 months. To top off that it announced a postponement in announcing its results. Well, I have made my review or opinion on the company previously before. Seems like it is a lesson learnt through the hard way for MOL in Nasdaq although it provides them with much higher valuation, but it can also discredit the company easily, unlike Malaysia's stock exchange. Well, it has that short selling tool, as well! Will taxes on vehicles drop as well?